Background: St Rose was born Isabel Flores in Lima, Peru; her country was then a Spanish colony. She chose the name Rose at her Confirmation. St Rose emulated the life of St Catherine of Siena. She fasted three times a week, abstained from meat, performed many physical penances in secret and spent numerous hours in devotion to the Blessed Sacrament. 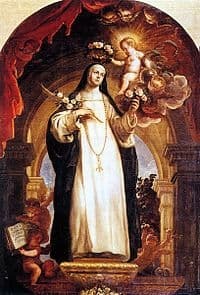 She joined the Third Order of Dominicans and used all the money she earned, from the sale of flowers and fine embroidery, to care for Lima’s poor. St Rose died at the age of 31yrs. Her Feast Day is the 23rd of August. amid the alluring blandishments of a deceitful world. and to make yourself like your heavenly Spouse. Jesus Christ, Who lives and reigns world without end. Amen.